The Namale life is still as fresh in our minds as the daily mojitos we enjoyed in SavuSavu during our time there. We can still smell the fresh mint, and taste the refreshing lime as we reminisce on our islandy days in this sunny wonderland. We dream of operating on Namale time, and crave our 3:00pm afternoon nap in the hammock overlooking the ocean. I can feel my eyes slowly closing just thinking about the sound of the waves smashing into the sand. We were so blessed to rejoice in Jesus’ resurrection in true paradise. We enjoyed Easter morning by starting the day with room service. The Namale staff took our breakfast orders, as well as the entire resorts, the night before at dinner. They brought room service to each bure. We were delivered fresh breads in a beautiful hand woven palm frond basket. Sean and I relaxed in the sun, went paddle boarding, and said goodbye to our favorite parts of the resort! We had such a blast paddle boarding. We laughed the entire time because we kept falling…we don’t know if it was the pitcher of mojitos we drank before or the waves crashing into the boards. All we know is that in the midst of laughing our butts off, we were stranded in the middle of the lagoon for 2 hours laughing hysterically. The hotel staff even took it upon themselves to take the boat out to check on us not only once but twice to see if we wanted a lift back to the resort. I will never forget that Easter morning of laughter. I wish I could go back. The Namale team does an excellent job of making you feel like a true part of their family. Upon leaving, they have you sign a cement brick, and they place the dried bricks around the entire resort enticing you to come back and find it. We were so sad to leave as they loaded our suitcases into the van and sang us traditional Fijian goodbye song. Happy Easter! We love our Handmade Palm Frond basket. Happy Easter! He has risen! Today was wonderful. I swear I think this place is magical or something. The staff at Namale bends over backwards to make you feel special. The hotel can hold up to 44 people, and has about 105 staff members. They do this purposely to make sure each person has more than enough attention. To top that off, they purposely only book half occupancy so everyone feels more than accommodated for! Sean and I rarely bump into other couples! We went snorkeling with another couple, and the dive staff took us to the most beautiful reef! It definitely gave the Great Barrier Reef a run for its money! We saw vibrant colored coral, a shark, and a turtle. The food here is to die for. The chefs and pastry chefs really know what they are doing. You can order anything you’d like at any time of the day as many times as you’d like, regardless if it is on the menu. 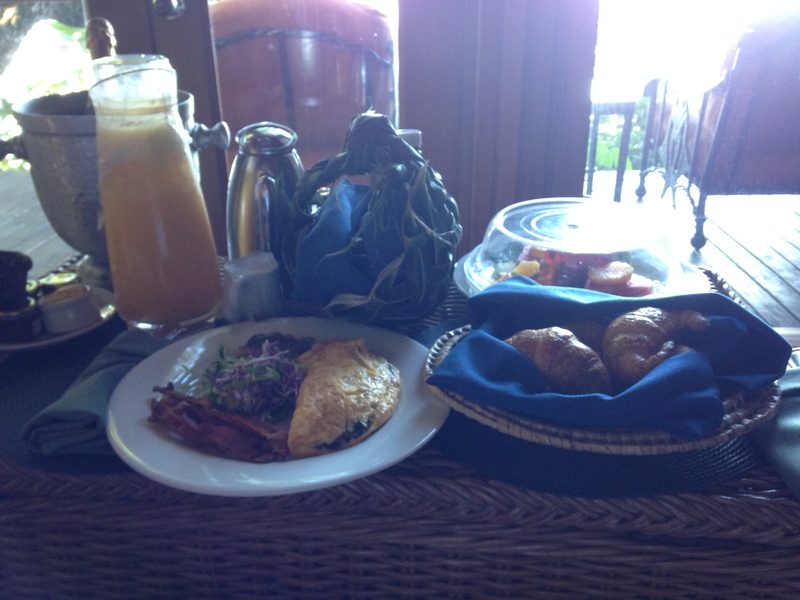 Sean and I woke up and had the most delicious oceanfront breakfast. We then relaxed all day! It was heavenly. Namale allows you to eat wherever you want on property. There are several private dine out locations that we have been taking advantage of. We had them set us up with a beautiful private happy hour to watch the sunset, in which they served us cheese and crackers, chips and salsa, and mojitos before dinner. We ended the night watching the Miller Dance Company, a Polynesian children’s dance company. They were sooo cute, and really good! 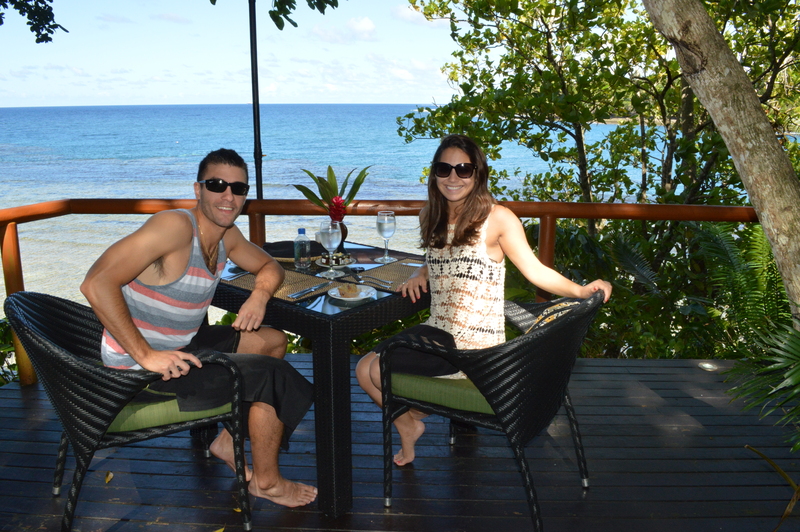 Breakfast by the water is the only way to have breakfast! We had a great breeze, and the water was beautiful, what more could you ask for?